This entry was posted on March 24, 2012 by emandmichael. It was filed under Melanoma . Hey Emily, it’s been a few months. All of my most recent tests have come bam normal, ldh levels, chest X-ray, and physical checkups (still getting used to being naked in front of female residents my age haha) and I do another PET scan in 3 months. Looking forward to my 2 year mark. Thanks for sharing and caring. Keeping calm and having peace of mind is the hardest and most jarring part of this journey. Feel free to check out my blog of you haven’t yet. 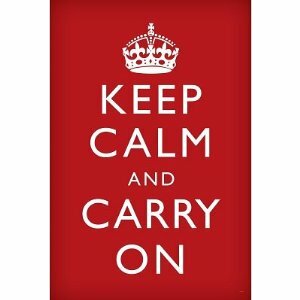 Love this post and that saying, “Keep Calm and Carry On”. I might have to steal that for my blog (heehee)! 😉 I am so grateful we crossed paths and I know it was for a reason. I am excited about the Gala in May. We are hoping and working on getting sponsors and silent auction items! Let’s cross our fingers! Ever since Mike’s diagnosis we have met so many truly amazing people who LIVE with melanoma. Our “mole mates” are inspirational. I was bursting with pride when our friend Christina McEvoy was featured in the NY Times . Christina has Stage 4 melanoma (in remission). Between treatments of Yervoy and caring for her young children, she started a group in Idaho for melanoma survivors (Sol Survivors). An amazing woman! Our other friend Sue Lescure had her eye removed due to her ocular melanoma. What torture she has endured – all with such grace and beauty! She is also amazing…and in remission! And I can’t forget my friend Shari. When they found melanoma in her brain and lungs she stayed very positive. This is a woman who, a day after brain surgery, came to see me in Palo Alto and brought ME a gift – a little porcelain bird that says “Be Brave” painted on it. I am happy to report that Shari is also in remission.